These are the proceedings of 22nd annual conference on Astronomical Data Analysis Software and Systems, which was hosted by the University of Illinois. There were 172 attendees from 19 countries who had a broad range of backgrounds including theoretical astrophysics, both ground-based and space-based observational astronomy (optical, radio, infrared, x-ray, etc. ), and computer software and hardware development. A total of 34 talks (9 invited) and 66 posters were presented. The topics at this years' meeting included: (1) Community Development; (2) Advances in Algorithms; (3) Enabling Research; (4) Large Scale Computing; (5) Astronomy Applications for Handheld Devices; (6) Scientific Archives; (7) Data Reduction Pipelines; (8) Databases, Metadata, and Catalogs; (9) Tools, Libraries, and Toolkits; and (10) Observatory Specific Software. Several demonstration sessions of software and techniques were presented. "Birds of a feather" discussions were also held throughout the week, and are included in this volume. 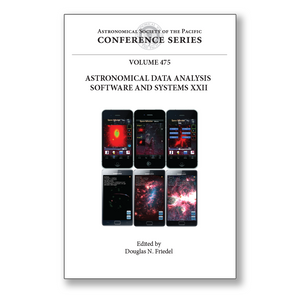 Additionally, the new journal Astronomy & Computing was formally announced at the conference. This volume will be of interest to anyone with an interest in computing and astronomy.